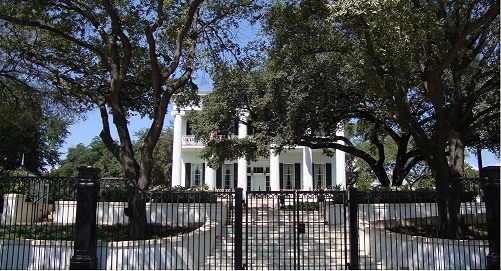 The Texas Governor's Mansion has been the home of every Texas governor since it opened in 1856. It is the oldest continuously occupied executive residence west of the Mississippi and the fourth oldest governor's residence in the U.S. It has been designated a National Historic Landmark and added to the National Register of Historic Places. The mansion was built specifically as a residence for the Texas governor and designed in the Greek Revival architectural style. It has a two story design with floor-to-ceiling windows, wide hallways, twenty-nine foot Ionic columns across the front, and ceiling heights of sixteen feet downstairs and thirteen feet upstairs. Tours of the mansion can be arranged by advance reservation on certain days of the week as available. Visitors can see mementos of previous governors and First Families that have lived in the mansion, as well as portraits and original furniture, like Stephen F. Austin's desk and Governor Pease's sofa. Click here to learn more about the Governor's Mansion and arrange a visit. Click here to view some pictures from the inside of the mansion.